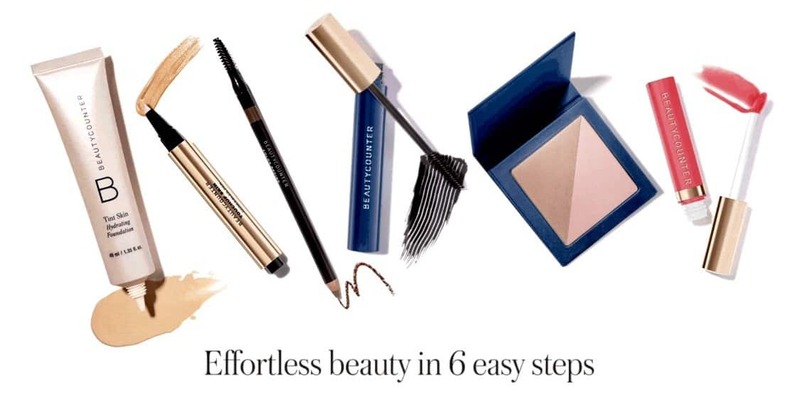 Ladies- this section is going to be heavy on the Beautycounter products. Here’s why- There is no other beauty company doing mission-based work to improve the laws in the cosmetic industry. There is no other company that goes to the lengths Beautycounter does to educate and advocate for health. By trading out your chemical laden makeup for these products you’ll be improving your own health, supporting advocacy & education, as well as preventing the number of chemicals your kids are coming into contact with as I know my kid touches my face frequently! This article contains affiliate links. We may be compensated if you make a purchase after clicking one of these links at no additional cost to you. This is an area that seems to be the last on the list when looking to “go-green”. It’s hard- we know! We’ve experimented with quite a few products out there and have been disappointed more than once. Beauty is subjective so we are going to give you the full low down on the products we love so you can make the best choice based on your preferences. Anneliese is the one who is really into this stuff and she loves doing personalized consultations. Send her an email at yourcorewellness@gmail.com or DM her on Instagram @yourcorewellness to schedule your one on one. One of our favorites is the Beauty Counter Flawless in Five set. This set is everything you need to have your face ready for public viewing and admiring in five minutes or less. Seriously- we’ve timed it! This is your I’m ready to start fresh and toss the toxic set. The set includes everything you see below. The website will help you to choose your perfect color match and you can’t make a wrong choice when it comes to lip gloss. They are flattering on all skin tones. Make sure you reach out to Anneliese on Instagram @yourcorewellness if you need help with the color matching. Vapour – Their soft focus foundation provides a satin finish. Check out Well People for a great powder foundation option. One thing that makes Beautycounter products so appealing to women is that the products have a very light and clean scent. They don’t smell heavily of herbs, flowers, or other fragrance. If you have acne prone skin this Balancing Set is a great choice for you. 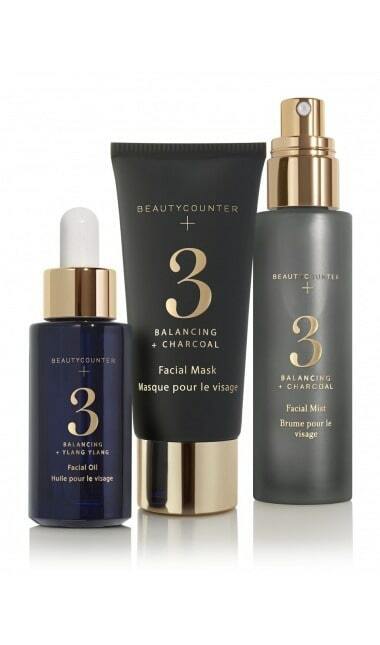 This Beautycounter set has everything you need for daily and weekly treatment. The mask can be used to halt an emerging pimple before it surfaces. The oil is lightweight and the mist is the perfect way to start your day or refresh your makeup mid-day. Yes, you need oil even if you have acne, you just need the right one. If you prefer the more fragrant products check out Vered botanicals. Vered is an amazing woman. She is an herbalist, esthetician, and healer and puts so much love into her products. One of my many favorites to recommend is the balancing face oil. The site Seamakers Co. is run by another mom-boss Mary who we adore. Her store carries really amazing products. 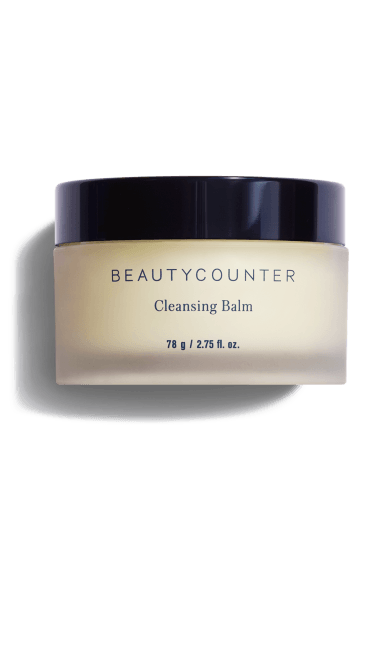 Our favorite cleanser is the Beautycounter cleansing balm. This best seller is the best way to remove makeup without stripping skin or having to deal with water splashing all over the countertop after you just cleaned up all the toothpaste your toddler spilled! The gentle massage you give yourself increases circulation and just feels so relaxing. Combine it with the exfoliating cleanser and you have just given yourself a spa-worthy treatment! Juice Beauty is another great company and they have a large selection of products. A simple cleanser to try is their Milk Cleanser which you can actually get on Amazon! If you prefer a gel you can try Acure cleansing gel. This one averages 4.5 star reviews on Amazon. The items listed here are just the tip of the iceberg. Connect with Anneliese on Instagram @yourcorewellness to ask her your specific questions and get recommendations tailored to your needs. But, for now, choose ONE product to swap out. I’m looking at that cleansing balm myself as I’m definitely guilty of not cleaning my face before bed. What do you use every day that could use a clean makeover? We’d love to hear what you end up tossing and replacing with safe beauty products. Check out my Instagram @diaryofasocalmama this week for some special extras for this post. Did you miss the first two posts in this Spring Cleaning series? 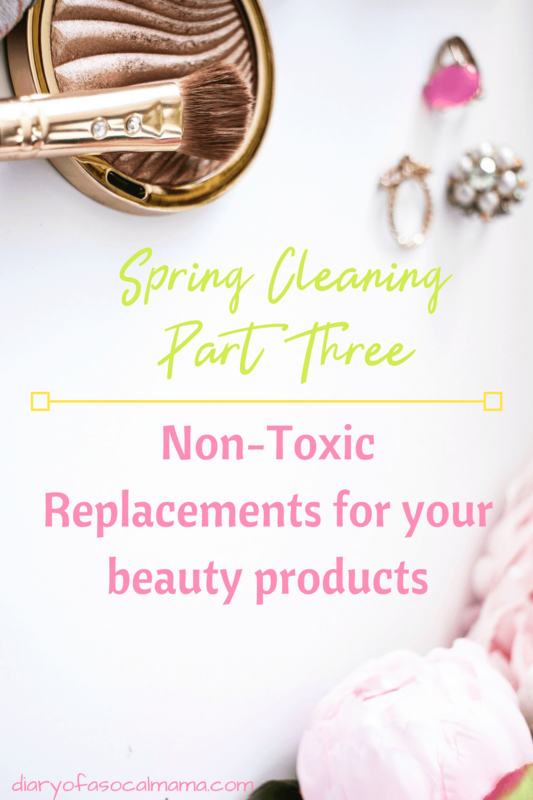 Check out the whole series all about non-toxic replacements for your products. Next week is the last post in the series where we’ll be talking about non-toxic replacements for your on-the-go products. Just in time to ditch some of your plastics for Earth Day! Phenoxyethanol is an ingredient I became aware of to watch out for in products when I became pregnant. Sadly, many products considered natural and even marketed as pregnant specific product contain this ingredient.